Drunken Strawberry Coconut Trifle is an adults only dessert made with coconut rum soaked cookies, strawberry whipped cream, coconut rum whipped cream, whipped coconut cream, and fresh strawberries. 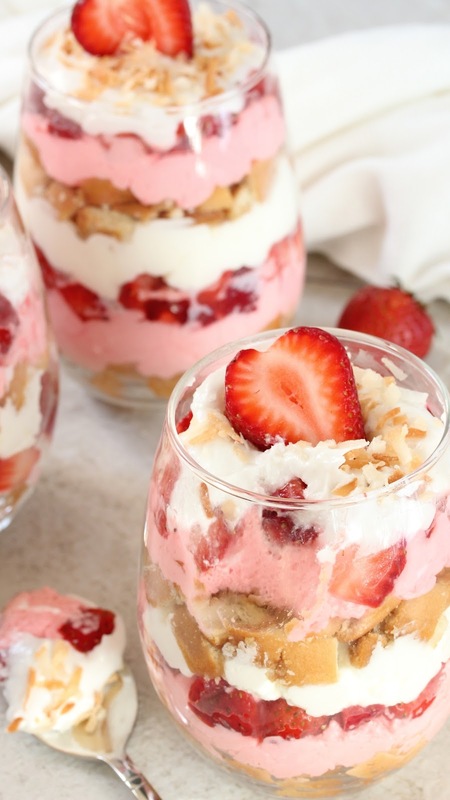 This trifle tastes cool, light, and refreshing making it a perfect summer treat. 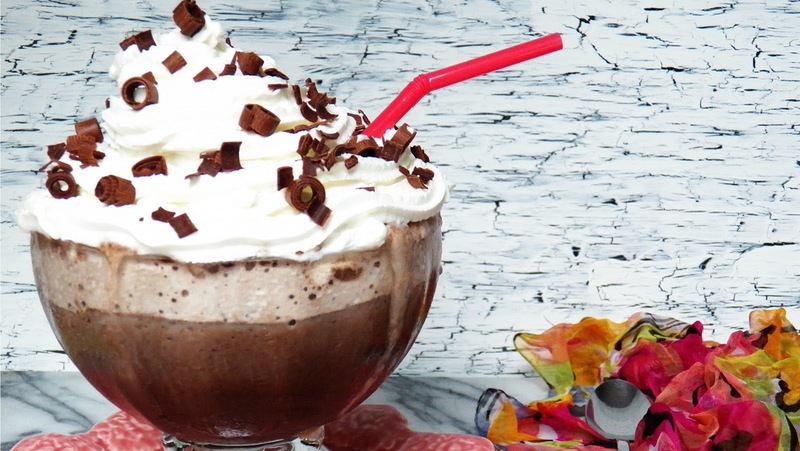 Okay guys, it's time to serve you up something decadent. 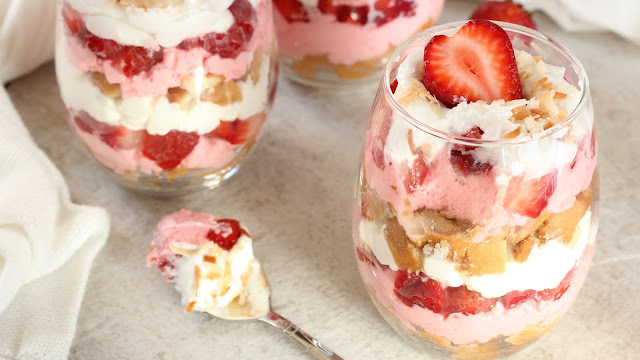 What I love about this trifle is that it's indulgent yet doesn't taste heavy, rich, or super sweet. The coconut rum soaked vanilla wafer cookies provide that oomph! 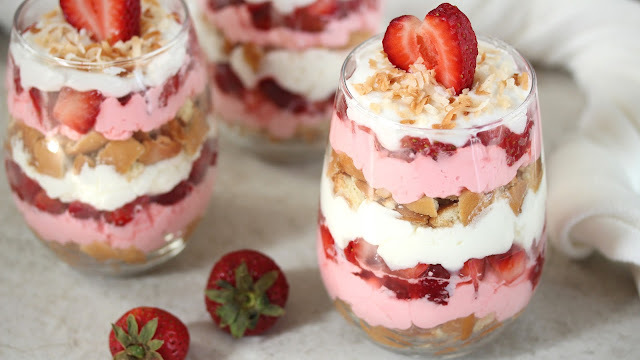 factor; the whipped cream layers are light, smooth, and silky; the strawberries bring in freshness; the whipped coconut cream provides an extra layer of creamy coconut goodness. 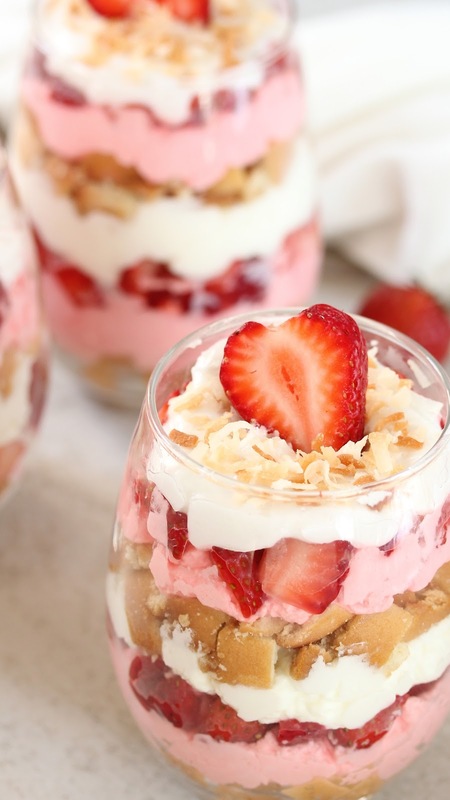 This no-cook-no-bake strawberry coconut trifle is the perfect dessert for the adult table. It works well for intimate get togethers or a larger crowd. This recipe makes four servings but can easily be doubled or multiplied. And if there are minors in the group, they too can enjoy the virgin variety—just omit the rum. We aim to please!! 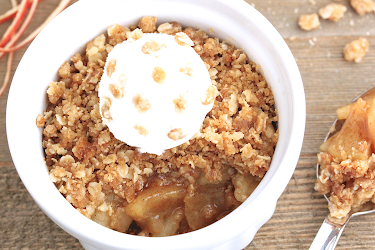 Just when you think you heard everything, there is another reason to love this dessert—it can be made ahead of time. Simply assemble everything a day ahead and keep refrigerated until ready to serve. The powdered sugar not only sweetens the whipped cream, it also acts as a stabilizer, enabling the cream to hold its shape and prevents it from weeping. Give this a try. You're going to love it! This recipe uses a hair shy of one pint of heavy cream. Save the excess cream for your morning coffee or tea. Or add it to your sauces. If your strawberries are tart and not fully ripe, add 1/2 to 1 teaspoon granulated after dicing to sweeten. Adding 1 teaspoon coconut extract to 1/2 cup of regular rum is a good substitute for coconut rum. For best results, dip only enough vanilla wafer cookies for each trifle as you work. Reserve the unused liquid from the can of coconut cream for other purposes: add to mixed drinks, use as a sugar substitute, add to baked goods. Chilling the mixing bowls, beaters, and cream of coconut before use is recommended but not essential. I don't and my whipped creams come out just fine. Hull strawberries with a paring knife. Cut into small dices. If tart, sprinkle with 1/2 to 1 teaspoon granulated sugar. Set aside. Remove 1/2 cup of the solids from the can cream of coconut and place in a small mixing bowl. Reserve the remainder of the can content for other uses. Beat the coconut cream on medium high until it becomes thick, creamy, and white (about 1-2 minutes). There will be more than enough whipped coconut cream for tis recipe. Set aside. Scrape excess coconut cream off beater. Place 3/4 cup heavy cream and 2 teaspoons rum in a small mixing bowl. Beat on medium, increasing to medium high. When cream begins to thicken and increases in volume, gradually add powdered sugar. Beat until cream is smooth, fluffy, and holds a stiff peak. This should only take a minute or two. Scrape excess whipped cream off beater. 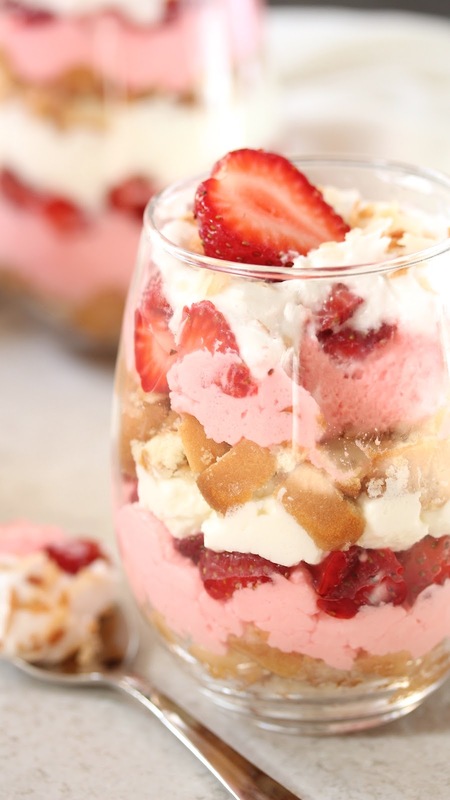 Place 1 1/4 cup heavy cream and strawberry flavored drink mix in a medium mixing bowl. Beat on medium, increasing to medium high. When cream begins to thicken and increases in volume, gradually add powdered sugar. Beat until cream is smooth, fluffy, and holds a stiff peak. This should only take a minute or two. First layer: half of the rum soaked cookies. Second layer: 1/8 of strawberry whipped cream. Third layer: 1/8 of the strawberries, drained of juices. Repeat the layering a second time. End with a top layer of whipped coconut cream. 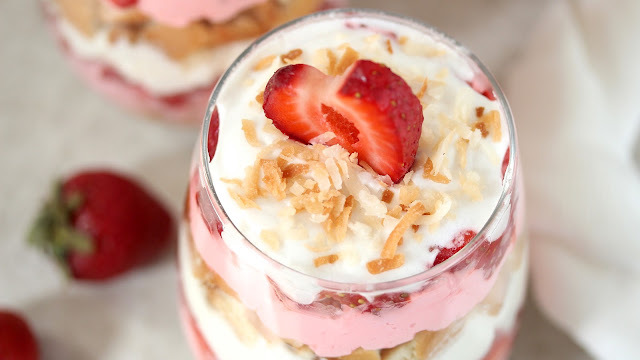 Garnish with toasted coconuts and a strawberry slice. Repeat assembly steps for the remaining trifles. Chill for 1 hour or overnight. Hey Thao!! 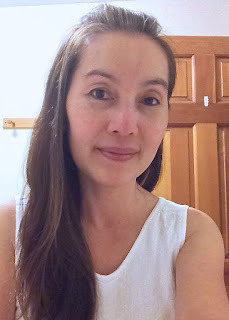 I was just boppin' around your site as I love to do, and these caught my eye! They're BEAUTIFUL!!! And perfect for Valentine's Day! (As are your recent pop recipe, which I love!) Happy Tuesday, friend! Thanks you, Stephanie!! 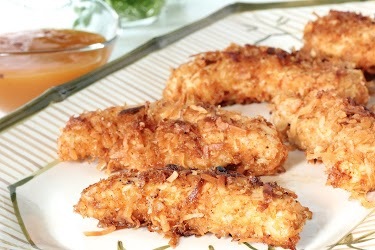 Now that you've mentioned it, I'm kinda craving these! Maybe I'll have to make myself for a special treat on Valentine's Day! Happy Tuesday to you too! !